He added that the Australian debate (Glikson verses yours truly) had been noticed Czech Kosmoklub site, where a regular writer was impressed. (See the discussion thread called “Sun and Climate” at the Kosmoklub web-site.) Shucks, that made my day. I gather it’s a site for well informed cosmonautics enthusiasts. Lubos also recommends Klimaskeptik.cz. (And I notice they have already linked to the Czech version Příručka skeptika). UPDATE May 29th: Mr Kremlik has added an English speaking section to Klimaskeptik. Click on the cover to download the 680 K version. There’s also larger 5Mb version for printing. 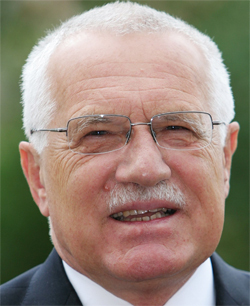 The Czech Republic is also home to Vaclav Klaus, the only leader who is brave enough to say what he thinks, and smart enough to be well informed. The economist and libertarian President has been likened to Thatcher (and as it happens he apparently keeps a photo of her in his office). Klaus is an outspoken skeptic and far from being savaged by the public, after 7 years in office in a recent poll he was still popular with 74% of Czechs. If people form or find other places to discuss climate science in Czech, I’ll be happy to update this post. Volunteers have also translated the first Skeptics Handbook into German, French, Norwegian, Finnish, Swedish, Turkish, Portuguese, Danish, Japanese, Balkan, Spanish, Thai, Czech (here) and Lao. The second Skeptics Handbook is available in French and Turkish. See all posts tagged Translations. UPDATE 2: From comments below. I will be seeking some confirmation and further information about those lists and Czech sites: Blood Donors?! Here many contributors complimented Czech people for their inherent skepticism. It might be true for majority of the population but not for Czech water melons. The Czechs call Greens water melons as they consider them being Green on surface but Red in all the bio-mass inside. There is a lot of reason for it. E. g. now, there are two Czech Facebook groups “Antifa” and “Zelená levice” (Green Left) that contain declaration saying besides others: “Mother Earth is thirsty for blood of clero-fascistic pigs. … and her craving will be satisfied.” The site contains list of right-wing and environment disobedient publicly known people who should be hanged and burned at squares after “becoming” election victory of Green Left. Vaclav Klaus is on the list of course, too, and there is an appeal on their co-religionists for tips with other names for the list of blood donors for the thirsty Mother Earth to be gratified. Thanks to David C for spotting the “it’s” in the title. UPDATE 3: An improved version of the translation. Thanks to Klimaskeptik.cz. Czech Republic is probably the only western nation that never really believed all the CO2 crap. Good for them. I also adore their beer. The Czech people can recognise the signs of authoritarianism, dressed up as being for the good of society, in a way that most of our liberal western democracies are incapable of. Their healthy distrust of authority, engendered by the Czech history of the late 20th. century, was given expression through the distinctive Czech tradition of cartooning, in the face of oppression. I think your Sceptic’s Handbook will go down particularly well with them, on both counts. Interestingly Roger Piekle Jr picks it up and in the comments of the treads makes some startling comments about “hide the decline” tricks , defending them as a fudge not a fraud. As for Copenhagen summit and its issues, we must look at it with both plain common sense eyes and with huge amount of available environmental and economy data that confirm that there is no global warming. And if there is then it is completely out of human influence and caused purely by powers of nature. By the way, last week we got to know that significant part of the environmental data used by IPCC were either completely intentionally forged or misinterpreted. That is why it is a good thing the Copenhagen summit has crashed. 1. Diversion from the aggressive so called green politics. 2. The politics will return to the real topics, which are urgent for the citizens now in the economic recession time. 3. Wastage of tax-payers money for the controversial green projects will be stopped. 4. A space for an effective discussion on reasonable, effective and cheaper energy extraction will be opened. Return of common sense to environmental politics will push back the absurd and extremely expensive projects of so called clean energy generation from the wind and solar systems. 5. The nuclear energy will experience a renaissance. 6. The Euroatlantic civilization will stop obtruding countries in Africa, Asia and Latin America with her politics “fighting global warming”, for which the countries simply don’t have funds and which consequently means curbing of their chances for economic grow and social welfare. 7. When I meet citizens of my country informing them that European Parliament prefers above all solution of global warming they shake their heads in disbelieve what we solve here instead of real solutions for their benefit. Off-topic, but folks in Massachusetts are determined to relearn the hard lessons that California (among others) have already learnt about wind power. I have just reread your e-mail exchange with Michael Kundu. Do you think he is starting to feel uncomfortable in his cosy little world yet? It’s surprising how easy it is to forget just how much has changed and how quickly it has changed. Good job, Mr Pavlíček. It may be a good idea to promote it at some Czech-speaking sources exactly for the people who prefer to read Czech over English, and therefore don’t attend this blog: Klimaskeptik.cz, The Invisible Dog, and others. I see it as the land of the sensible. Czechoslovakians know what Communism imposed upon people is – they can see clearly that the senselessness imposed “for the good of the State” is the same concept imposed “for the good of the Planet” by a once deservedly maligned and disregarded UN. I see the Czechs are also speaking out against some of the financials plays being made in the EU at the moment. Not afraid to be a lone voice. The irony of of Klaus admiring Thatcher is that it was Thatcher who started the funding for the CRU at East Anglia when she was fighting the miner’s union. But I’m sure she did not intend that it turn out the way that it did. It is true. Nevertheless, 30 years ago the hypothesis of CO2 driven warming was legitimate and test-worthy. Now, it has been tested and refuted as a piece of science bat its soul is marching on as a pseudo-science bogus of AGW ideological doctrine that serves good for transformation Thacher cherished liberalism into corporativism. Wow, has Spain seen the light? Those who remember the USSR ~ 1989 might be interested in the following op-ed, and Lubos and his countrymen would know it in any case. Why doesn’t anyone care about the unread Soviet archives? I should add that AGW is being promoted by the deadliest ideologues in history. - are you sure this wasn’t taken from the proposed Kerry-Lieberman legislation? Politicians are never that explicit. If they say it they do it in implicit way. May be the Radomir Clement who spread the declaration across the Czech Facebook Left and Green web-sites only translated what politicians told in implicit into an explicit form. But research from the University of California has found higher levels of CO2 in the atmosphere could lower yields and the quality of food. The study is published in the journal Science today, and shows plants don’t convert nitrogen into proteins as well as they normally do, when more carbon dioxide is in the air. Lead author Professor Arnold Bloom says applying more fertilisers could solve the problem, but there’d need to be a more sophisticated management program. Just over the weekend we had Transperth, our metro transport authority air a new PSA on television promoting the use of public transport, especially the train. The ad appeared well made, using influence from the recent Transformers movies, such as cars queued up on a congested freeway transforming into a train. The irony of it, I might add, would be the imagery of all those people inside the cars being squished as the “Train-bot” mechanism squashes all their cars during its metamorphosis. Seems to me the government’s propaganda campaign about “evil CO2″ is just about to hit a new intensity. Sooooo…. The plants grow faster, but their nutritional value is poor because of the low nitrogen content (low protein). No good for people. Buuut… There’s plenty of protein to support the plagues of insects that will be the next infestation. Explain that one to me sometime. do insects use a different plant protein to people? The other question is – why do the ABC publish this bilge? For those who see the parallels between the Old Testament and the AGW’s, this corresponds to a scene in Exodus – the 10 plagues of Egypt. Speedy, the availability of food is not the limiting factor for many insect plagues. Here in WA from what I understand it is summer rainfall that maximises the locust egg laying, probably coupled with other factors. It’s much harder to heed the message when the speaker has food down his/her front – in this case a glaring grammatical error in the heading. I wonder: “what is the source of this it’s, its, and (even to my dismay)its’ confusion?” – even by professional scribes. No doubt that it is a generational thing – the result of poor teaching. But then, surely it can’t be that hard to reform? Oh, and don’t give me the excuse that English is a living language – would Darwin have supported an evolutionary decline brought on by ignorance? 1. I thought the global warming was going to lead to desertification, hence lower rainfall – that’s what the BOM tell us. 2. You don’t think maybe the “other factors” you consider may include the additional feed arising from the additional rain? Anyway, I perceive a little inconsistency in the original argument. They are claiming that the additional plant growth won’t feed people but does a sterling in job feeding bugs. Otherwise, they would simply starve, problem solvered. I am sure BoM wasn’t that silly… they would have said that climate change will lead to more rainfall in some areas and less in others /golfclap for stating the bleeding obvious BoM. What they do focus on is the drying trends that have been obvious in the SE and SW of the country and the increasing wet up north. All in all there has been increasing rainfall in Australia when you look at the long-term history of the continent as a whole, but they downplay that statistic. BTW Speedy… did you see the latest on RC? Mike (Mann presumably) did exactly what we talked about in an earlier thread. Conceding that there were “anomolies” in the medieval period (he hates to call it warm… claims the effects were regional at best), he says the warmer periods in certain regions were caused by lack of vulcanism and increased solar activity etc… CO2 clearly was not the culprit back then. As predicted, everything and the kitchen sink affected climate back then, but only CO2, particularly the bad man-made variety, affects the climate today. Have a read of it… I am sure you will have a giggle at his expense. To be honest the article couldn’t be more vague if he tried. I have paraphrased and probably misrepresented his ramble somewhat, but what the heck… what he talks about is so vague and full of qualifications it is meaningless. Vague, illogical, economical with the truth, but Peer Reviewed and an invaluable addition to the IPCC body of knowledge! And the drones who quote these references to support their pet theory probably won’t read it too critically – if it all. A bit like that paper Andrew spat out last week – it may well have been published by Santer et al to muddy the waters, not to provide insight into the issue. All greenhouse owners who keep CO2 level at 1000 ppm for their own money to increase their plants profitability are probably stupid. The ancient word infested with huge dinosaurs and later with elephants and rhinos like today with rabbits could feed the monsters the only due to warm and high level of CO2. The monsters didn’t know they ate food of pure nutrition value and were so silly they grew and reproduce at that astonishing rate. If they knew how bad their lavishing plants are they couldn’t achieve their size and plentitude. And the silly insects don’t know the bad nutrient value too, that is why they should overpopulate. They of course need the same nutrients as vertebrates and some nitrogen for their exoskeleton creation on top of it while we have skeletons on Calcium compounds base unlike to insect nitrogen based skeletons. It will be probably a similar science like the proves that sea mollusks with shells of Ca2CO3 will extinct due to CO2 which was “conclusively” proved by experiments with etching acids in the water. If someone keeps a plant on conditions of nitrogen scarcity and CO2 oversupply the plant will grow faster but with less nitrogen compounds in its tissue. If the experiment would be executed in a soil so over-fertilized with nitrogen as is at bio-farms they had the correct issues. No you picky chit head (oops did I mis-spell that) it’s called working through until 2am, after having dealt with the regular all-day tasks involved in raising a family etc. Having voluntarily provided an informative forum for people like you and me, (or is that you and I, do correct me please you pedantic astard) [chit, I mis-spelled again], all you can contribute is a magnifying glass look at grammatical errors? Did you have something substantive to add to the gist of the thread? One wonders is this where the term comes from then, as LM is well travelled and seems to have popularised use of the term internationally. What became of the Hnutí Brontosaurus, a youth environmentalist movement back in the early 1990′s ? The reference to “watermelon” goes way back, at least to the 1930′s when Christian Democrats (official colour green) were called “watermelons” by Nationalist parties. to Joe Veragio – What became of the Hnutí Brontosaurus, a youth environmentalist movement back in the early 1990’s ? The movement “Hnutí Brontosaurus” was active mainly in 1980s. It existed as a tolerated organization under communistic rule. It used to be quite popular unlike to the current greens. After the collapse of communism the members usually took to different movements or to the Green Party so to Brontosaurus gradually vanished within early 1990s. Remember when Greenpiece was trying to eliminate chlorine? Wipe an element tight off the periodic table, mind you! I apologize. I cannot hear about “Hnutí Brontosaurus” very often but they still exist and are active. They are reputedly rather strong in areas Praha and Brno. I have asked about them and now I have responses. It looks like if they tested their strategy for the later CO2 hystery. The science show called the sleek geeks did that here in Australia. They told a few truths i.e. it is used extensively in heavy industry, and is present in all forms of cancer. They had a couple of students manning a booth getting people to sign a petition so that the government would ban it. After the mark had signed, a third person came forward and explained they had just signed a pettion to ban water, most people refused to believe the third person. And speaking of beer, has anyone contemplated the price increase of beer IF cap and trade happens???? Thanks to Lubos Motl for his endorsement here. However I got worried, that the English speaking readers, who click the link to my web can find there only Czech language gibbrish. So I prepared an English section on my web. It covers the “Czech footpritn in the global warming debate”. Surprisingly this small nation is quite visible in this field globally. Come and see.